VietNamNet Bridge – Young artists at the Phu Nhuan Drama Troupe will stage new plays including comedies for students during the three upcoming national holidays: the Hung Kings Memorial Day on April 14, Reunification Day on April 30 and Labour Day on May 1. 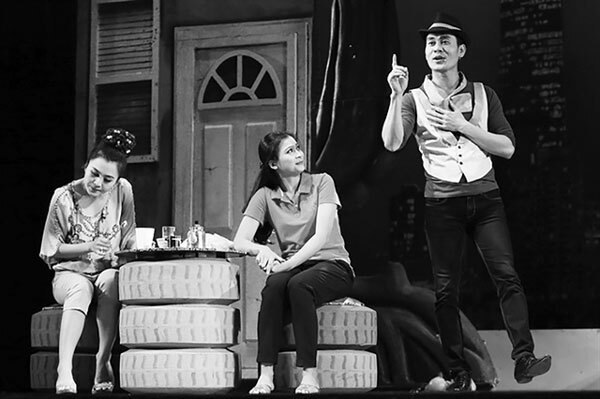 The plays to be staged include Mẹ Và Người Tình (Mother and Lover) and Hồn Oan (The Ghost) with actors Le Loc, Duy Duong and Hoang Linh. Director Minh Nhi uses both eastern and western drama styles to elaborate the plays’ themes of urban women and social problems. “I wanted to make quality shows for students when I was at university,” Nhi, who has been in the industry for more than 20 years, said. New versions of the plays will be staged now by young scriptwriter and director Dinh Manh Phuc with actors Hoang Long and Kha Ly, graduates of the HCM City University of Theatre and Cinematography. “Our troupe’s new plays use modern techniques and were challenging for the young staff, including graduates of art schools,” the troupe’s owner, People’s Artist Hong Van, said. “To maintain the stage, we need to train more young, skilled performers through live shows,” Van, a veteran who began her career in 1993, said. Thanks to her efforts, Phu Nhuan Drama Troupe is one of the city’s leading private theatres and also a place for young actors to improve their skills. “Our theatre offers quality shows at just VND80,000 (US$3.4) to attract students,” Van said, adding there would be free performances for the poor in rural districts on April 30 and May 5. The comedies, Tầng 13 and Đui Mù Câm Điếc Xử Án, will be staged every Saturday and Sunday in April and May at 70-72 Nguyen Van Troi Street in Phu Nhuan District.